After our epic road trip from Chicago to Yellowstone, we were itching to plan another fun road trip. We thought it was about time to make the drive from Chicago to Florida. Oh, and what a fun road trip it was! Our road trip included plenty of fun stops, museums, tons of food (especially BBQ), and of course ice cream. Ready about our Chicago to Florida road trip and get inspired to plan your own big trip! Just an hour south of Indianapolis is the small Midwestern town of Columbus, known for its modern architecture. Zaharakos, an old-time ice cream parlor and former candy shop, is a must-stop especially if you love ice cream (Who doesn’t?). Not only have they been churning their own homemade ice cream for years, but they happen to have a small museum on site with soda fountains and mechanical music of the past. On a sugar high? 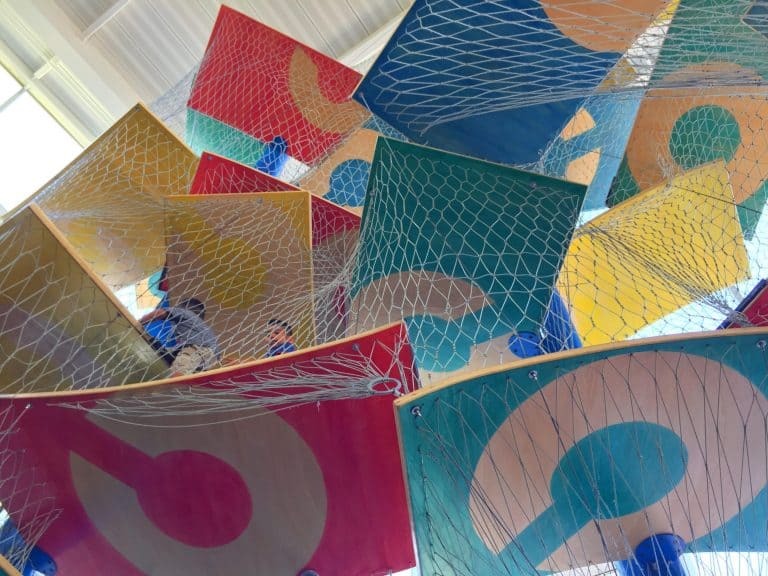 Lucky for you – they have an indoor playground at The Commons with an awesome Luckey Climber. If time allows, the kidscommons Children’s Museum, a couple doors down, might be worth a visit to see the famous giant toilet. We do hope to visit again and explore more of the art and architecture around the city! Find deals on family-friendly hotels in Columbus, Ohio. Our final destination for the day was Glasgow, Kentucky but not before grabbing dinner at local favorite, El Mazatlan. Although the food was pretty tasty, my husband and I were blown away by the large (and strong) 16 oz. margaritas for just $4! A well-needed reward for our first day on the road. Find out what else you can do in South Central Kentucky. We had a comfortable night’s stay at the Holiday Inn Express Hotel & Suites Glasgow. Gotta love the free hot breakfast in the morning! Read Trekaroo’s review of Holiday Inn Express Hotel & Suites Glasgow. Look for deals on hotels in Glasgow, Kentucky. Spending the day at Lookout Mountain is well worth your time. Head underground for a fun cave experience to see Ruby Falls, one of the tallest underground waterfalls. Take a ride up the Lookout Mountain Incline Railway’s steep one-mile trek up the mountain. 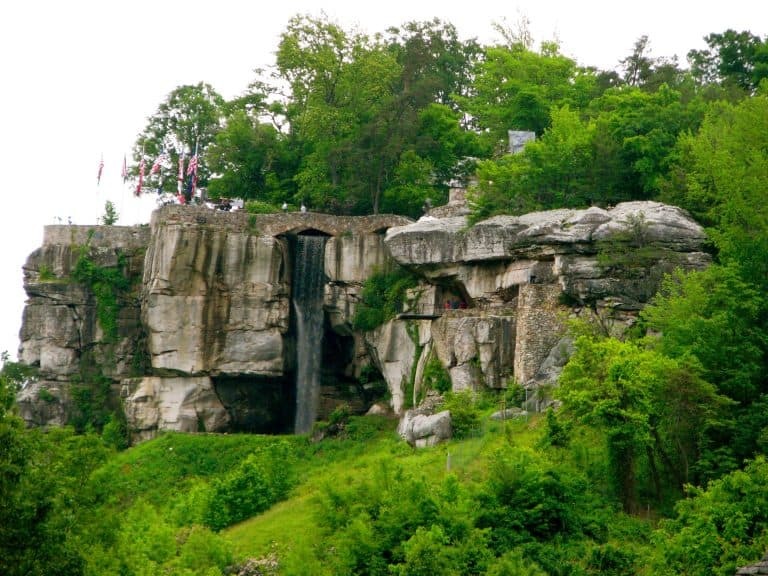 Our favorite Lookout City attraction though was Rock City with its incredible vistas, waterfalls, and landscapes. Love animals? Learn about the river and ocean animals at the Tennessee Aquarium. If time allows, I highly recommend scheduling a backstage tour for either the river or ocean building. Go behind the scenes of the penguin habitat, watch stingrays and sharks being fed, then try your hand at feeding fish and possibly a turtle. Learn about the city of Chattanooga on land and sea aboard a Chattanooga Duck, an amphibious vehicle. Take a stroll down Walnut Street Pedestrian Bridge, the world’s longest pedestrian bridge which links the downtown area to the eclectic North Shore. Find your favorite flavor of moon pie (our personal favs are caramel or strawberry) at the Moon Pie General Store, where it’s made fresh daily at their only manufacturing plant in Chattanooga. You will NOT go hungry in Chattanooga. Fried chicken is king at Champy’s Fried Chicken, along with fried catfish and fried pickles. Don’t miss out on their homemade sweet tea. If you’re looking for finger-lickin’ BBQ with large portions, Purple Daisy Picnic Café is the perfect spot. Save room for an after dinner treat. Their super yummy banana pudding with Nilla wafers is so, so good! If you’re anywhere near the Tennessee Aquarium, follow the smell of cherry-smoked BBQ at Puckett’s Grocery Store. Treat yourself to any of the unique and amazing ice cream flavors at Clumpies Ice Cream Co. Looking for amazing burritos? Mojo Burrito by the base of Lookout Mountain is calling your name. And when (not if) it’s donut time, try unique flavored donuts at Julie Darling Donuts. Read all about the top 8 things to do in Chattanooga with kids. Located along the Tennessee River, the bright and comfortable SpringHill Downtown Chattanooga/Cameron Harbor boasts a fantastic location ideal for morning strolls or runs. The downtown attractions are a few minutes drive or quick bike ride away (they have a bike share program for easy exploration). The rooms are ideal for families- modern, spacious, and comfortable. Plus, who can resist a free hot breakfast offered daily? We couldn’t pass through Georgia without trying sweet Georgia peaches. Luckily, we found Lane Southern Orchards just 5 minutes from the highway. Not only do they sell the most amazingly sweet peaches, but we were pleasantly surprised to partake in a self-guided peach tour that showed us the process of cleaning, sorting, and hand-packing peaches from their orchard. We couldn’t leave without trying food from the cafe including their homemade peach cobbler topped with their homemade peach ice cream. What a fun, educational, and tasty stop! Georgia is also known for pecans, so we had to make a pit stop for pecans. Located right off the highway, Ellis Brothers Pecans has aisles and aisles of pecans in every flavor. Can’t decide what flavor you want? They offer samples of each flavor! Hint: This is a great potty time spot — the restrooms were clean. Obsessed with eating BBQ (we were in the South after all! ), we were ready for more at Smok n’ Pig BBQ in Valdosta, Georgia. What a fantastic value! The portions were huge so the kids and I were able to share. In addition, the salad bar and dessert were included. Find family-friendly accommodations in Georgia. 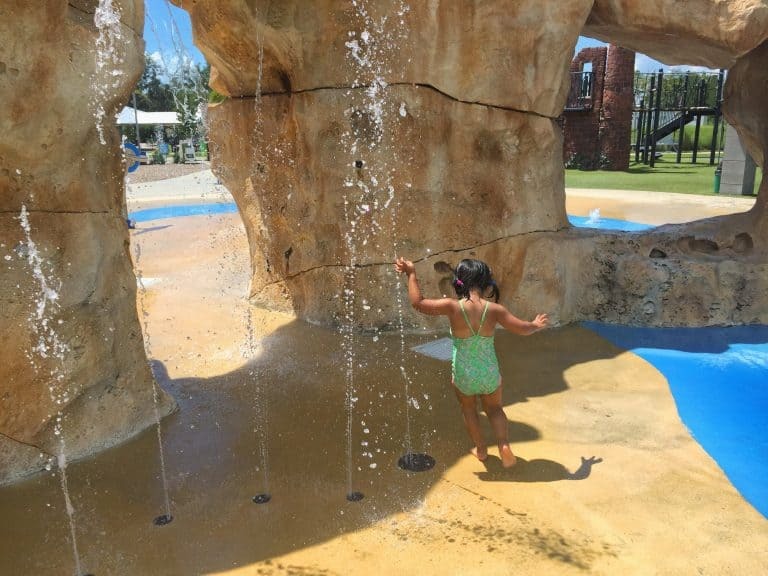 If the weather is on your side, make sure to bring bathing suits to Depot Park’s splash pad in Gainesville, Florida. Not only do they have a pretty awesome train-themed playground, but there are also trails, a general store, and a museum not too far away. Located in a convenience store (yes, you heard that right!) Pearl’s Country Store & Barbecue, may have had the most unexpected location we visited but one of the best bbq meals we’ve had the entire road trip. 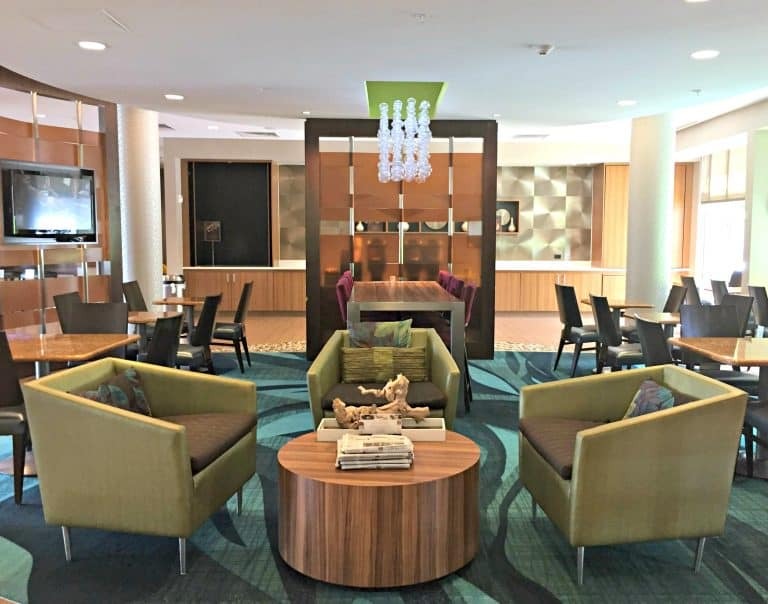 The new Holiday Inn Express & Suites Alachua – Gainesville Area was the perfect stop for us after a few hours on the road: clean, comfortable rooms, a pretty nice fitness center and of course, free breakfast. 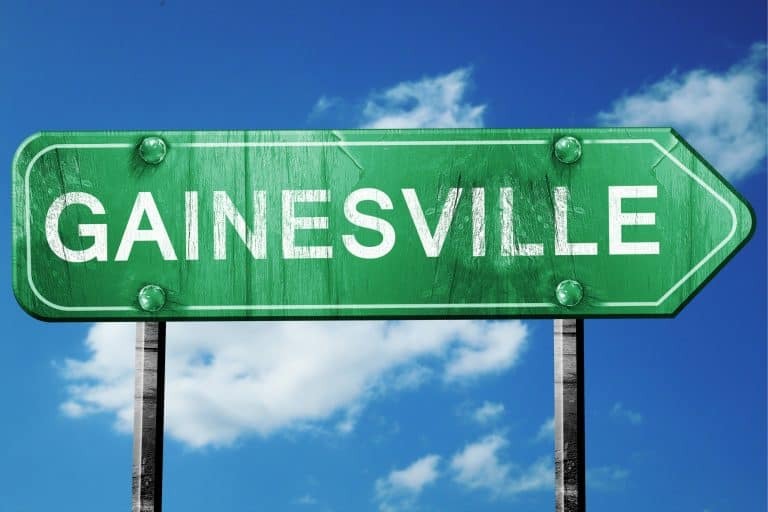 Check for deals at hotels for the whole family in Gainesville. Nestled between Tampa and Orlando, the biggest attraction in Central Florida’s Polk County is none other than LEGOLAND Florida Resort. However, after spending some time here, we found more family-friendly things to do and wished we had more time to explore. 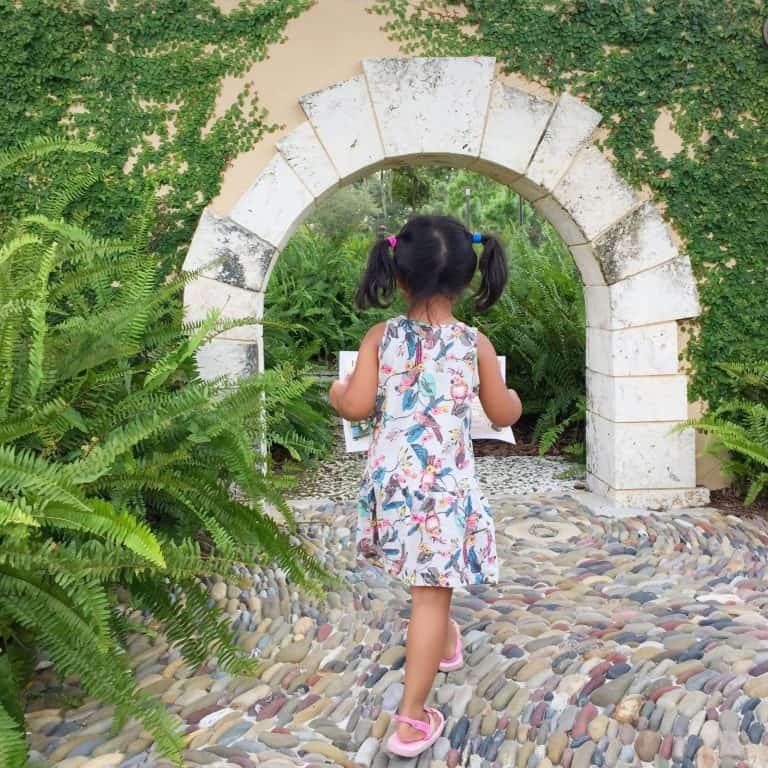 Bok Tower Gardens, a national historic landmark, has beautiful gardens to peruse including the 205-foot Singing Tower with daily carillon concerts. The kids loved exploring the 2.7-acre Hammock Hollow Children’s Garden. Children can climb a giant spider web, build, balance across logs, create art masterpieces, and then cool off in the fountain. It was the perfect place for kids to connect with nature! My kids had an absolutely brick-tastic good time at LEGOLAND Florida Resort. We saw a Miniland on steroids, hung out with our favorite ninjas in Ninjago World, devoured apple fries, splashed away at LEGOLAND Water Park and bought a few new Lego sets to add to our collection. Everything was indeed awesome! Want more LEGOLAND fun? Here’s your ultimate LEGOLAND Florida guide. At Hampton Inn Winter Haven, you’re no more than a five-minute drive from LEGOLAND Florida Resort (LLFR). Before LLFR had their own accommodations, the Hampton Inn used to be part of their “Bed and Brick” program. With little brick-tastic touches throughout the hotel such as a Lego guy to snap photos with or Lego coloring sheets with crayons, the Hampton Inn gets kids excited for a theme park visit. To top it off, the hotel offers free popcorn in the lobby. Parents, on the other hand, will appreciate the complimentary hot breakfast needed for a day full of fun. Another great option to stay is next door at Holiday Inn Winter Haven which also used to participate in the “Bed and Brick” program. Check for deals on hotels near LEGOLAND Florida Resort. We stayed a night in the Sunshine State’s capital of Tallahassee. In the short time we visited, we found it to be a friendly city with great food, and we wished we had more time to explore. We were blown away with the Tallahassee Museum — so much more than a museum! The mostly outdoor 52-acre museum showcases native wildlife habitats, a zoo with animals such as panthers, jaguars, and even bears, along with educational exhibits and dinosaur sculptures throughout the grounds. 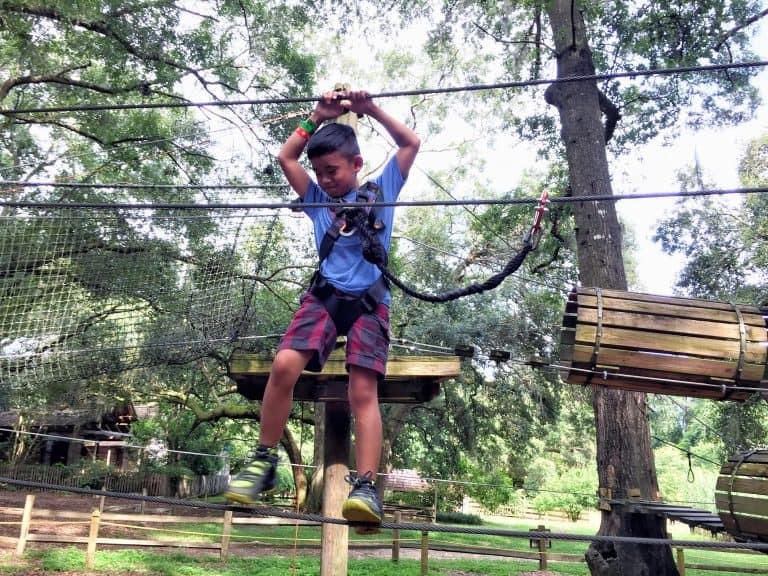 The kids had a blast going from tree to tree at the Tree-to-Tree Adventure Park, an outdoor zip line and adventure course. After a fun-filled adventure at the Tallahassee Museum, we couldn’t wait to chow down. Lucky for us, our next stop was the Midtown Caboose with epic burger creations. A stop at Lofty Pursuits, an ice cream and candy shop, was the perfect way to end the day. 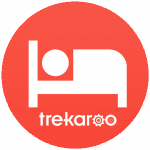 Trekaroo loves Tallahassee. Find the top 10 things for families to do in Tallahassee. 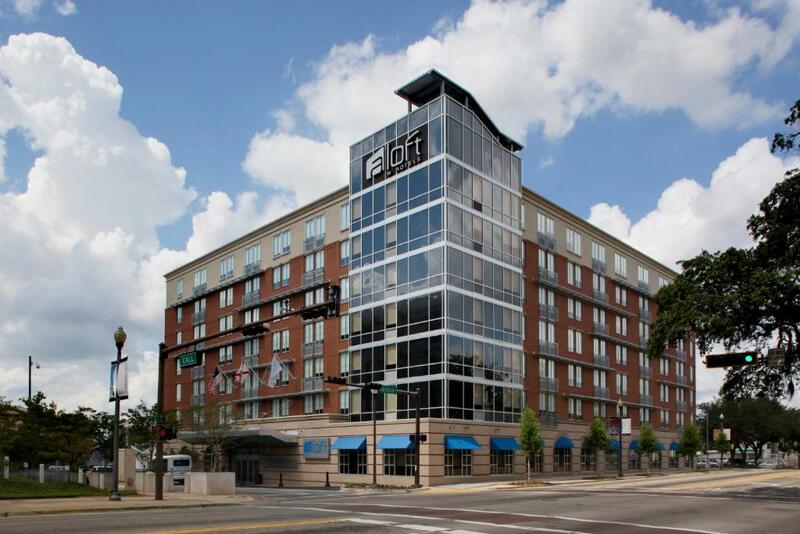 At Aloft Tallahassee Downtown we found a hip, trendy hotel with a pool table in its lobby. The xyz bar was hopping and us adults couldn’t resist a cocktail or two. The kids though were ecstatic to receive a goodie bag full of toys upon check-in. The pet-friendly hotel even fosters a dog at a time until it finds the dog a forever home. How awesome is that? Whenever I think about our time at heart of the Emerald Coast, I sigh and immediately wish we were there again. It was our slice of paradise on our road trip. 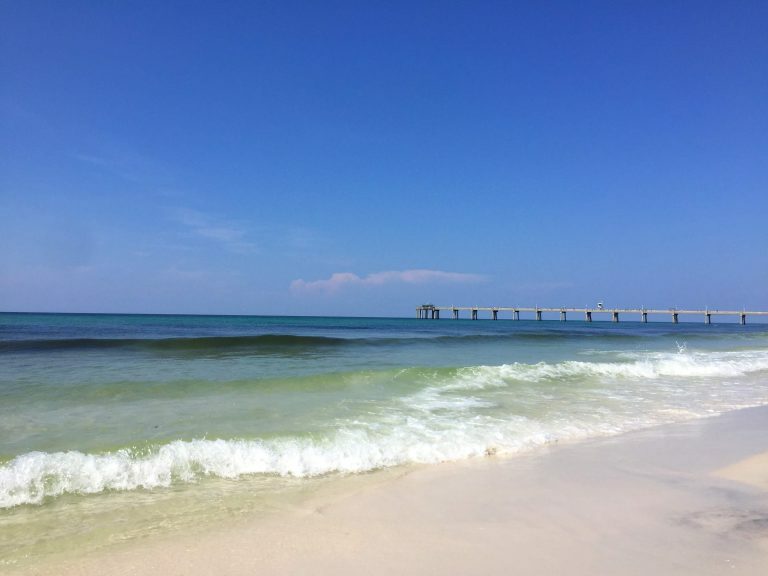 Whether you want to fill your time with activities, lounging on the beach, or both, exploring the heart of the Emerald Coast promises a great time spent with the family. Walk along The Boardwalk on Okaloosa Island and Okaloosa Island Pier for fantastic views of the emerald green waters. While there, take a break at Al’s Burger and Beach Club with fantastic views of the beach and ocean while munching on awesome burgers (hello ahi tuna burger!) and sipping on your fave tropical drinks. Spend as much time as possible catching some rays at the beach, while the kids can build sand castles with the white, soft sand. Love dinosaurs? How about golfing with dinosaurs at Wild Willy’s Adventure Zone? Afterward, escape to the arcade for more fun. Ever wanted to see dolphins in the wild? Spot them on Southern Star Dolphin Cruises. Can’t get enough of the animals? The Gulfarium holds dolphin and sea lion shows and showcases other area animals including an albino alligator. Have more under-the-sea fun with bowling at Uncle Buck’s Fish Bowl, while sipping your fishbowl drink and snacking on gator bites. Head straight down 98, to the quieter town of Fort Walton Beach for food. You won’t be disappointed grabbing food at The Cowhead where you can customize your burger any way you want it (chicken, beef, or even bison) or stick with any of their tested recipes. After your meal, head a few doors down for snow cones at KC’s Sandbar and Grille. Whatever flavor you choose make sure to get it with ice cream and topped with homemade sweet cream. Thank me later! The beachfront hotel, The Island by Hotel RL, was everything we could want in a beach vacation: easy access to the beach and more pools to splash in including one with a swim-up bar. We absolutely loved our recently renovated rooms and the kids were pretty excited to finally have their own room with a bunk bed. Learn all about space at the U.S. Space & Rocket Center in Huntsville. Grab food at Supper Heroes, a superhero-themed restaurant. If you need to stretch your legs, The Paducah Riverfront in Paducah, Kentucky is a great place to walk while looking at historical murals. 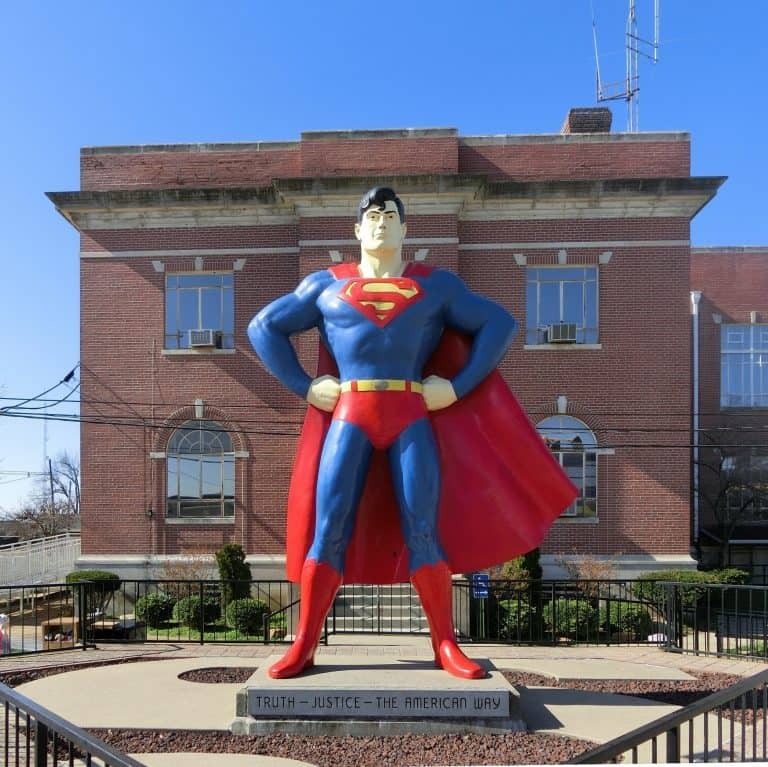 Visit the hometown of Superman in Metropolis, Illinois with plenty of photo ops throughout town including a huge statue of the man himself and a museum dedicated to all things Superman. 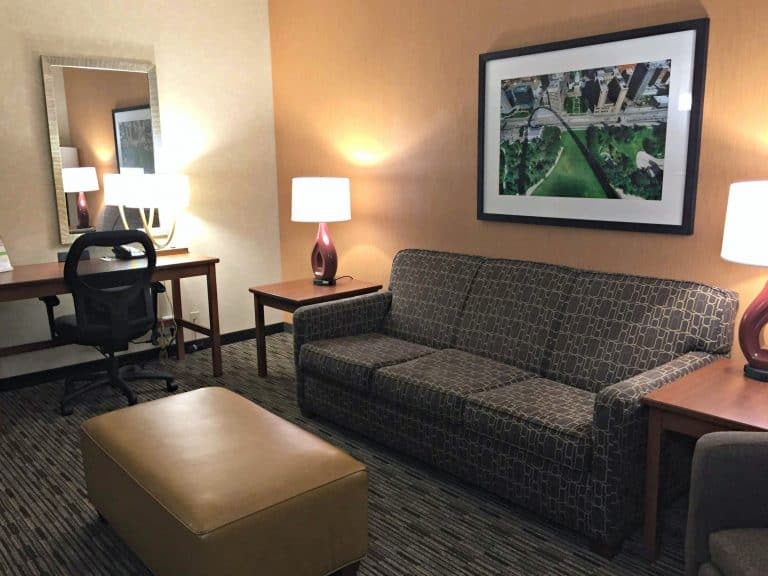 Our overnight stay at Holiday Inn Express & Suites Huntsville West – Research Park was exactly what we needed after a day on the road: clean, spacious rooms and free breakfast in the morning. 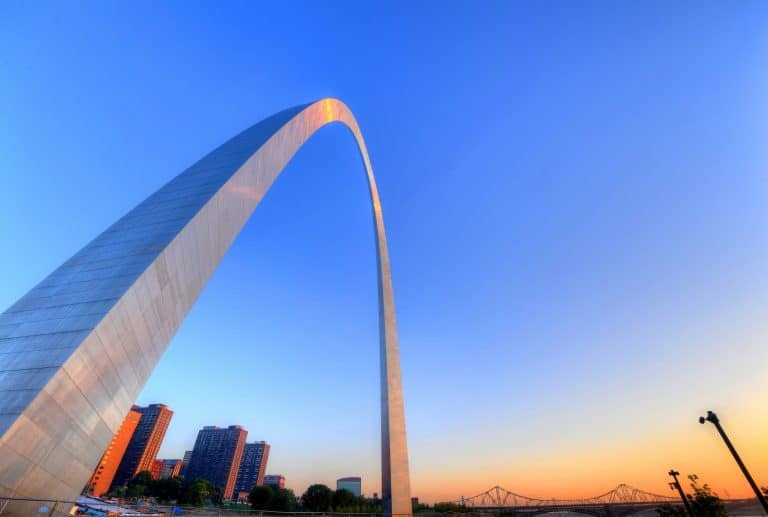 We’ve been to St. Louis in the past, but with the $380 million CityArchRiver renovation project finally complete, we were curious to see the transformation to the Gateway to the West. We made it a priority to check out the new changes at Gateway Arch National Park which, of course, has to include going up the Gateway Arch and experiencing the updated tram tour. It’s crazy, it’s cool, and at times it’s overwhelming, but you’ll have a total blast the unique City Museum. It’s an adventure for both kids and adults. There are tunnels that lead you to who knows where, an indoor skate park, slides in the most unexpected places, and so much more. It’s hard to describe in words. You must experience it yourself! The free Saint Louis Science Museum with dinosaurs and space exhibits is totally worth a visit. Make sure you visit the outdoor area with rain garden and chickens, plus cross over the sky bridge to the Planetarium to see the cars zooming underneath you. If the St. Louis Cardinals are playing, you shouldn’t miss a game at Busch Stadium. Have you ever tried St. Louis-style pizza? Imo’s Pizza is the place to go. Don’t forget the toasted ravioli. Get your ice cream fix at Clementine’s Naughty and Nice Creamery where you can indulge in homemade ice cream as well as boozy ice cream creations. Try Afghani food at St. Louis’ first Afghani Restaurant at Sameem Afghan Restaurant in The Grove. Feast on the Emperor Plate with lamb and chicken kabob, rice, and salad perfect for sharing. One of our favorite chains to stay at is the Drury Inn, where the extras aren’t extra. We had a free hot breakfast with plenty of choices, free popcorn, free soft drinks, free alcohol (yes, free! ), and free light dinner. Our stay at The Drury Plaza Hotel St. Louis at the Arch was no exception. The location rocks and is just a few steps away from the Gateway Arch and Old Courthouse. Find deals on family-friendly hotels in St. Louis. 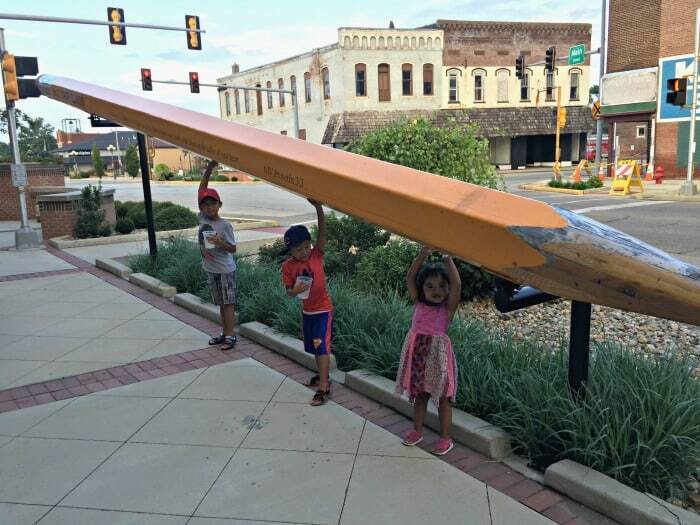 Before heading back home to Chicago, we couldn’t help but make our final pit stop at the charming small town of Casey, Illinois, home to eight of the World’s Largest items. We had tons of fun grabbing a map and taking pictures in front of all the world record holders including the largest wind chime, rocking chair, a mailbox and more. What a great way to end our road trip vacation in a big way! Are you road trip ready? Check out our favorite road trip games for kids with free printable before hitting the road. Disclosure: Many thanks to Chattanooga CVB, Visit Central Florida, Visit Tallahassee, Emerald Coast Convention & Visitors Bureau, and Explore St. Louis who hosted us for the purpose of writing this article at several hotels and attractions. I was not required to provide any specific review and all opinions are my own. The road trip is rather addictive, isn’t it?! We went camping for 5 1/2 weeks from NC to Yellowstone and now we have a road trip planned next for Florida, too. Have you had the bbq at Pappy’s Smokehouse in St Louis? We’ll try and check out some of the places you mentioned on our next road trip. Thanks!